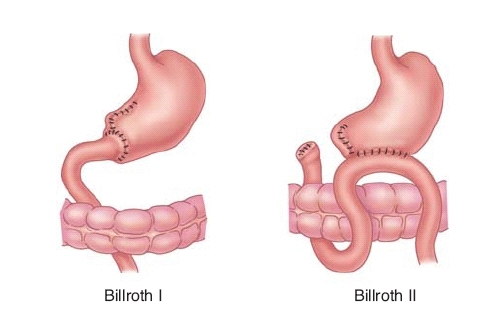 Billroth I, more formally Billroth's operation I, is an operation in which the pylorus is removed and the proximal stomach is anastomosed directly to the duodenum. The operation is most closely associated with Theodor Billroth, but was first described by Polish surgeon Ludwik Rydygier. ^ Billroth's operation I. Online Medical Dictionary. Centre for Cancer Education, University of Newcastle upon Tyne. URL: http://cancerweb.ncl.ac.uk/cgi-bin/omd?Billroth's+operation+I. Accessed on: June 15, 2008. ^ a b Billroth's operation I. whonamedit.com. http://www.whonamedit.com/synd.cfm/2730.html. Accessed on: June 15, 2008.